FK chats to Sophie of unique jewellery label sophie.b, debuting at the upcoming Melbourne Markets! Tell us a bit about sophie.b and what products we can expect to discover? Sophie.b is a mix of sculpture, design, craft and fashion. 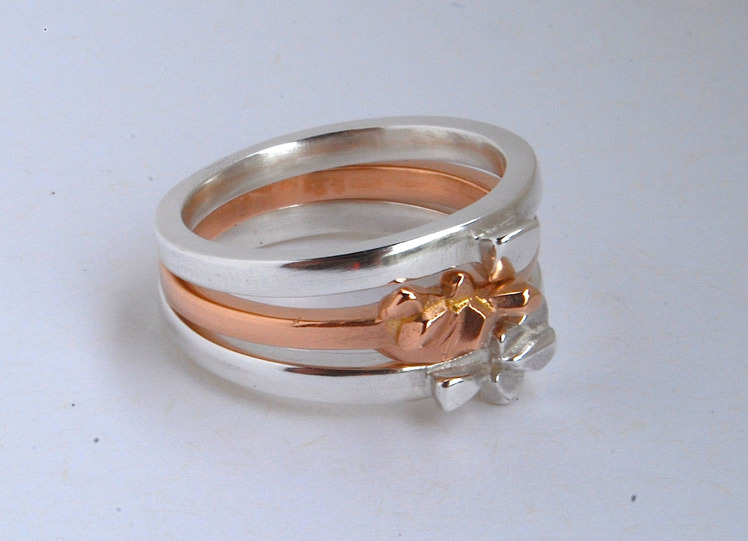 There is a combination of ‘one and only’s’, custom made, and pieces from the range-mainly rings at this stage. Jewellery is such a potent medium and says so much about a person. Sophie.b’s mission is to make beautiful pieces that can be special, unique and fun. What is your background and how did you started working with jewellery? My background has been ‘work hard, play hard’ in the film and theatre industry. After studying design and theatre-crafts for 6 years in Australia and an apprenticeship in sculpture in Italy, I have been designing and making whatever came my way which has led me to many interesting places and worked with many colourful characters! I have been lucky knowing all along that I need to make things and see things. Maybe because I cant really do anything else! I always wanted a ‘real job’ and be glamorous, be smart, wear suits and nail polish but always found myself in the workshop in grotty clothes covered in toxic waste, eating lollies all day long. So, jewellery is the perfect combination. I was so thrilled when it dawned on me to start Sophie.b. It is the perfect fusion of glamour, style and craft. I think creative styles change with the person/designer as they grow. My style used to be quite theatrical and flamboyant but is now simple and understated. Inspiration comes from so many places. The most reliable and constant source is somewhere in me, given all the external conditions are in line! Stepping away from my immediate world now and then always sparks ideas. I would probably say seeing other cultures and landscapes is a big one for me. I have always had a workspace somewhere, somehow, but have tried to keep it separate to my home to avoid burn-out. These days, I am very lucky to have a workshop in the backyard with fruit trees, rabbits, chickens and kids running around which I love. At night I like to turn up the music, make jewelry and disappear into my ideas. My work space is still separate from the house (about 10 steps away) and over time, I have become more disciplined with stopping work when it is time to stop and not bring it into the house. Time is the biggest challenge. Never enough. Sophie.b was launched in March this year, so it is all very new and there is so much to do. I have spent a lot of my working life making other peoples designs and ideas become real .The best thing about having your own business is that they are your own ideas that you are making real. It is very rewarding and yet almost narcissistic. I always thought art was indulgent and self orientated, which is why I chose commercial art over fine art, but I have slowly discovered that it is actually hard work and very exposing. Artists are giving all they have and are open to social criticism. You can’t hide. You have to take it all and wear it. It actually contributes to shaping a culture and it’s people. It is essential for humanity or we would all be in boxes with robots feeding us. I guess I am saying that I love the freedom! What new plans do you have for sophie.b this year? The new ‘Alaska’ range which is very different to the ‘Three sisters’ range. I don’t have any grand plans. I think getting to know my customers dictates where I may go. I really enjoy talking to people and understanding what they like, which inspires me to design and make new pieces. I love seeing people happy with such a small and little thing. Image credit: Photos with model by Gen Kay. Wow, what an inspiring post! I especially love the first and last photos, and can’t wait to see more of your work at the markets! 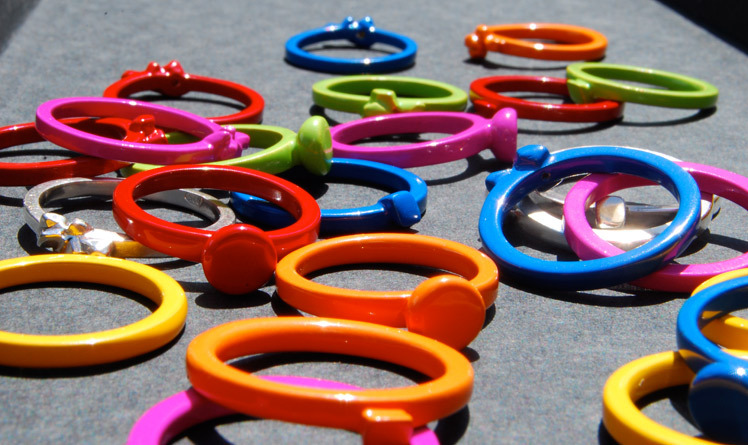 Love those colorful rings! Thanks for sharing!